it’s better to be a deity. and try to write on the sand. how can you raise your voice! and stop you from crying. and it’s the time to enhance. যাহার কোনো চিহ্ন নাই আজ! সময় বহিয়া যায়,মনে ভাবি হায়! _পারতে ঐ লাঠির ঘা নিতে? কিন্তু লাঠির ঘা তো নাই! আগে সঠিক পথ তো গড়! এ ভাষা তো আন্দোলনের নয়! এ সংগ্রাম কি তবে ভিত্তিহীনতার জয়? দুটো কি আর এক হল ভাই!! ব্রিটিশরা বলেছিল ওদের ভারত চাই! আর কথা বাড়িয়ে কি লাভ তাই? অজ্ঞাত বশে,যাকে তুমি ভেবেছ আমার পেশা! আঘাত লাগেনা এদের প্রতিবাদী ধর্মে? চুপ করে আছো যে বড়! দেখি তো; তাদেরও কিছু করো! ভীত হয়ে পড়েছ যে বড়! কেনো নতঃ শিরে তুমি দাঁড়িয়ে এখন? It is evident that for any value of , the values of the poles ; i.e the value of remains constant ; i.e . is the damped natural frequency. It’s evident from the figure that if ; i.e for a limitedly stable system,the mod value of the pole will be and there will be two poles at . 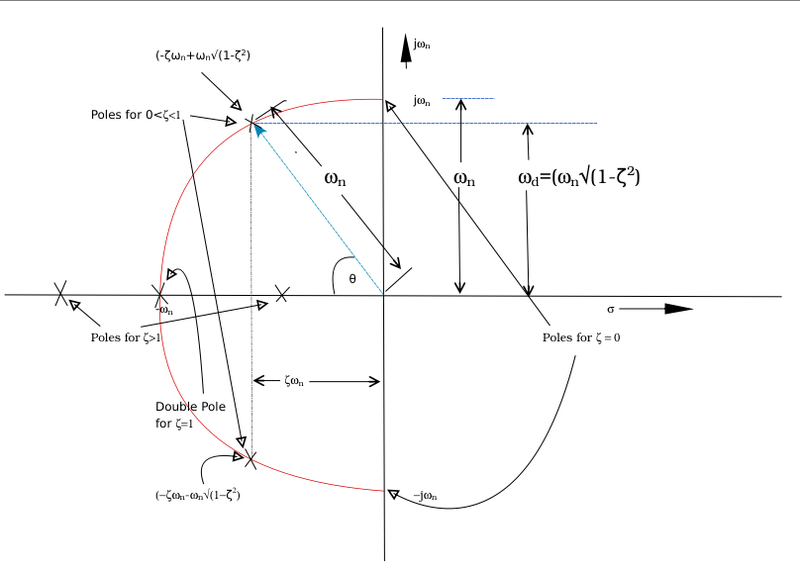 With the increase in value of pole will be shifted along with the perimeter of the half-circle with radius .The locus of the pole ; i.e the shown red half circle will be on the left side of the axis in the value of the real part is always negative ;i.e . When in case of a critically damped system damping factor ,both of the poles are at . In the range the poles traverse along the perimeter of the half circle(remember the radius is ),one pole starting from and the other one from , towards the left side of the axis, creating that half circular locus and they meet at when becomes . Now when continues to increase beyond ; i.e for a over damped system, there stays no imaginary part in the expressions of the poles, they break away from the point and start travelling in opposite direction along the real ( ) axis. Say the response is . [This will be proved in some other post]. So for basic understanding it can be concluded that for a second order Linear Time Invariant (LTI) system, damping factor is the decider for the stability of that system. [Details on LTI system stability will be discussed in some other post]. Here is considered as the frequency. Now defining in terms of is called frequency domain expression and defining in terms of time (where laplace transformation is used to express any system) is called time domain expression. A case can arise when is not periodic,this means has no period and time period is tending to infinity and so . As it’s non-periodic function, so obviously its frequency can’t be defined. This is a non-periodic function where ,means this function doesn’t repeat after a fixed period of time. 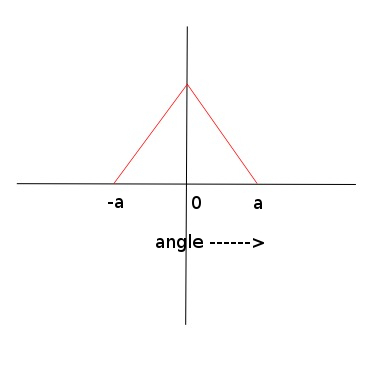 As here is non-periodic function, and ,so becomes meaningless in the above expression. So it has been shown that for a non-periodic function we have to first get the fourier trasform of that function (Of course firstly by verifying Dirichlet conditions) to get the fourier series of that function.